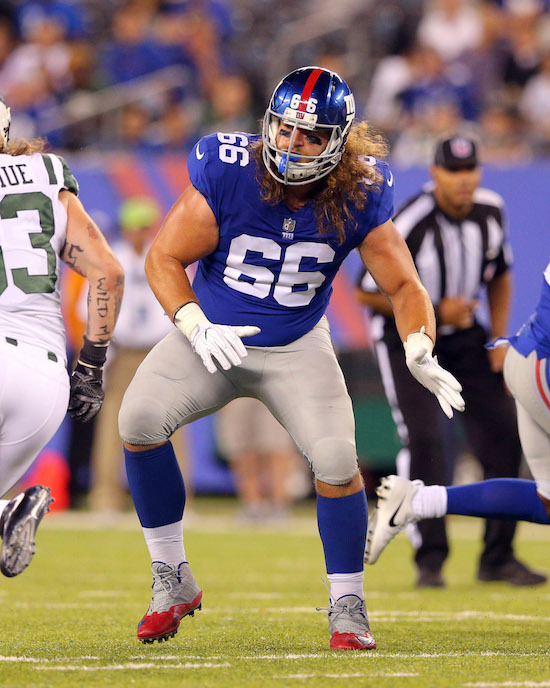 The New York Giants made 12 roster moves on Monday, signing six mini-camp tryout players and waiving six players. The Giants signed running back Robert Martin, wide receiver Alonzo Russell, offensive guard Chris Scott, offensive guard Malcolm Bunche, cornerback Chris Lewis-Harris, and cornerback Mike Jones. The Giants have also waived tight end Stephen Baggett, offensive lineman Adam Bisnowaty, linebacker Derrick Mathews, cornerback C.J. Goodwin, cornerback Brandon Dixon, and cornerback Bryon Fields. The 6’3”, 206-pound Russell was originally signed by the Cincinnati Bengals as an undrafted rookie free agent after the 2016 NFL Draft. He spent his rookie season on the Bengals’ Practice Squad. The Bengals waived him in September 2017 and he was signed to the Practice Squad of the Arizona Cardinals in November 2017. He has not played in a regular-season game. The 6’4”, 340-pound Scott was originally drafted in the 5th round of the 2010 NFL Draft by the Pittsburgh Steelers. The well-traveled Scott has spent time with the Steelers (2010−2011), Green Bay Packers (2012), Tampa Bay Buccaneers (2012), Tennessee Titans (2012), Buffalo Bills (2012), and Carolina Panthers (2013−2016). Scott has played in 45 regular-season games with 12 starts. The 6’5”, 320-pound Bunche was originally signed as an undrafted rookie free agent by the Philadelphia Eagles after the 2015 NFL Draft. Bunche has spent time with the Eagles (2015), Hamilton Tiger-Cats (2017), and Jacksonville Jaguars (2017). He has not played in a regular-season game. The 5’10, 185-pound Lewis-Harris was originally signed as an undrafted rookie free agent by the Cincinnati Bengals after the 2012 NFL Draft. He has spent time with the Bengals (2012-2016), Baltimore Ravens (2016), and Denver Broncos (2017). Lewis-Harris has only played in 33 regular-season games with no starts. He is a smart player who has experience at both nickel and outside corner. Martin (Rutgers) and Jones (Temple) are undrafted rookie free agents. The Giants drafted Bisnowaty in the 6th round of the 2017 NFL Draft. Bisnowaty spent virtually the entire season on the Practice Squad before being signed to the 53-man roster in late December 2017. The Giants signed Mathews to the Practice Squad in early December 2017. Mathews was originally signed to the Practice Squad of the Washington Redskins in November 2015 as an undrafted rookie free agent and spent time on the Green Bay Packers’ Practice Squad in 2016 and 2017. Dixon was signed to the Practice Squad in October 2017 and the 53-man roster in November 2017. He started the last five games of the season and finished the year with 21 tackles, four pass defenses, and one forced fumble. Dixon was originally drafted in the 6th round of the 2014 NFL Draft by the New York Jets. Dixon has spent time with the Jets (2014), Tampa Bay Buccaneers (2014), Seattle Seahawks (2015), Indianapolis Colts (2015), New England Patriots (2015), New Orleans Saints (2015-2016), and Pittsburgh Steelers (2016-2017). The Giants claimed Goodwin off of waivers from the Arizona Cardinals in early May. The 6’4”, 220-pound Goodwin was originally signed by the Pitttsburgh Steelers as an undrafted rookie free agent wide receiver after the 2014 NFL Draft. Goodwin has spent time with the Steelers (2014–2015), Atlanta Falcons (2016–2017), and Cardinals (2017). Baggett and Fields were signed as undrafted rookie free agents by the Giants after the recently completed draft. Multiple media outlets are reporting that right tackle Ereck Flowers has finally decided to show up for the New York Giants “voluntary” offseason program that began on April 9th. The New York Giants have claimed cornerback C.J. Goodwin off of waivers from the Arizona Cardinals. The 28-year old, 6’4”, 220-pound Goodwin was originally signed by the Pitttsburgh Steelers as an undrafted rookie free agent wide receiver after the 2014 NFL Draft. Goodwin has spent time with the Steelers (2014–2015), Atlanta Falcons (2016–2017), and Cardinals (2017). He has played in 28 regular-season games with one start. 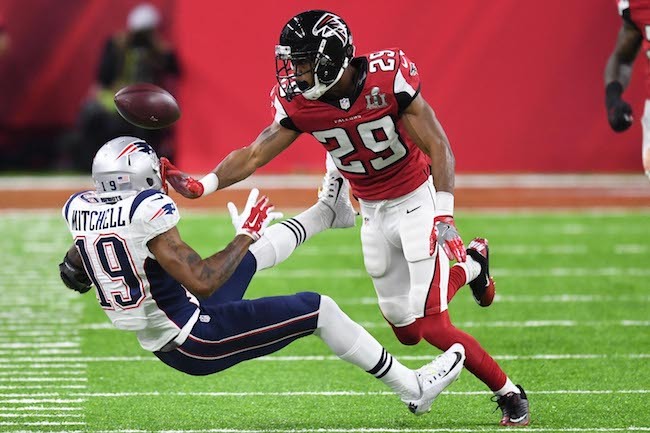 The Falcons moved Goodwin to cornerback in 2016. The New York Giants have signed safety Orion Stewart, who was cut by the Washington Redskins in April. The 24-year old, 6’2”, 205-pound Stewart was originally signed as an undrafted rookie free agent by the Denver Broncos after the 2017 NFL Draft. Stewart has spent time with the Broncos (2017), Buffalo Bills (2017), and Redskins (2017-2018). He has not played in any regular-season games.